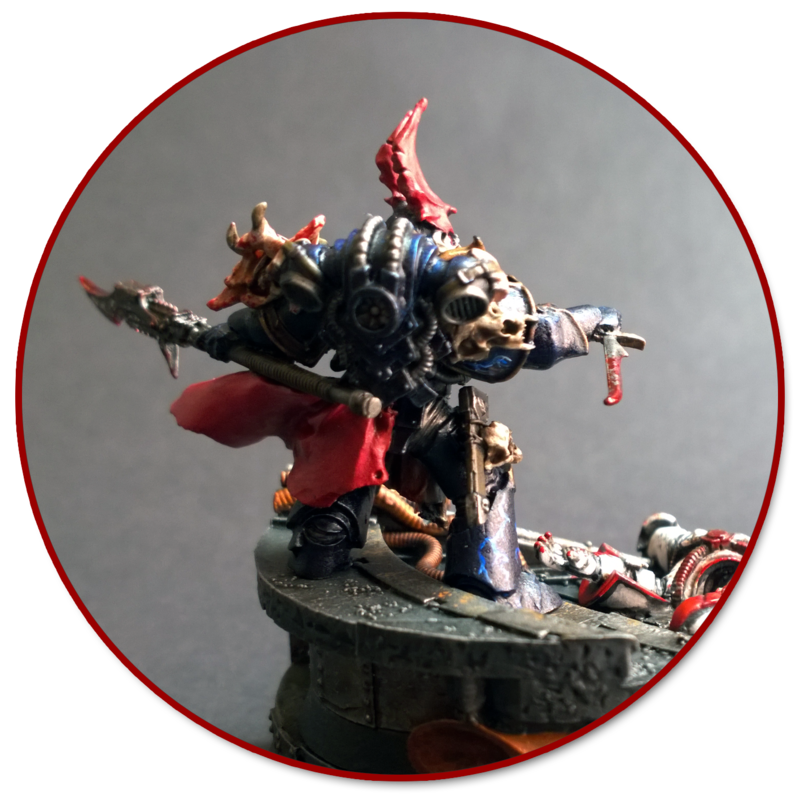 So, with that out of the way here is the most recent progress made to my fledgling 30K Night Lords force. 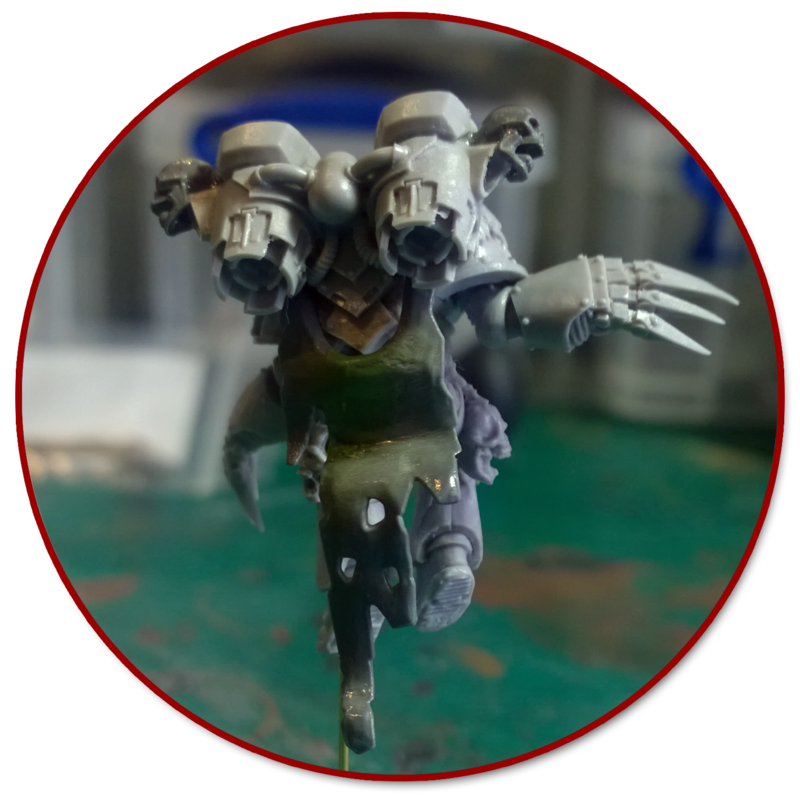 It’s mainly detailing left to do, shoulder detail, bones, flesh and the like. 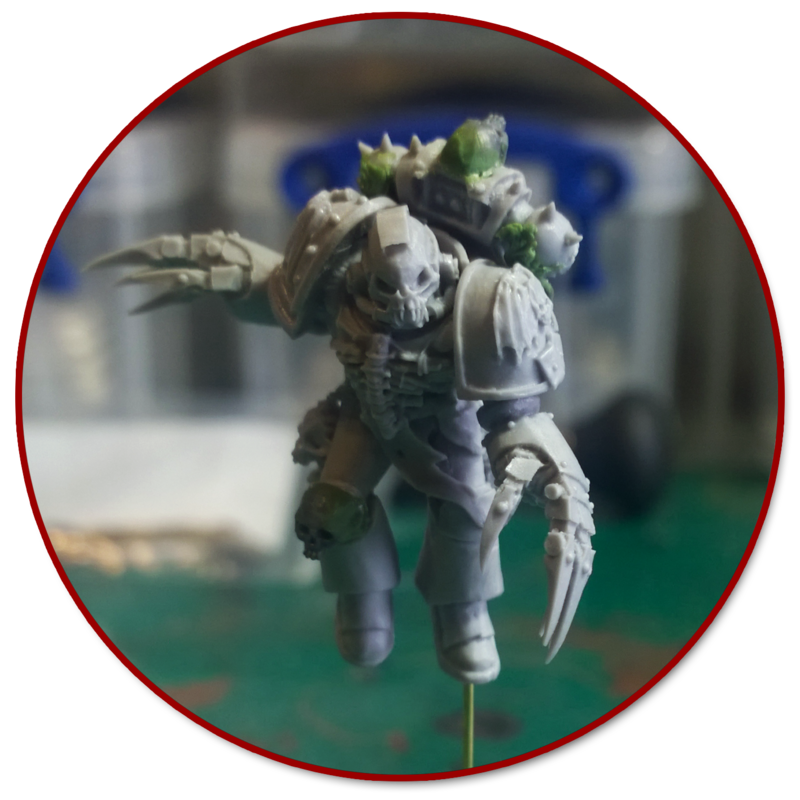 Here are some Work-in-Progress images of the Praetor, mounted on a fallen Son of Horus, again converted from the fallen GW marines kit. 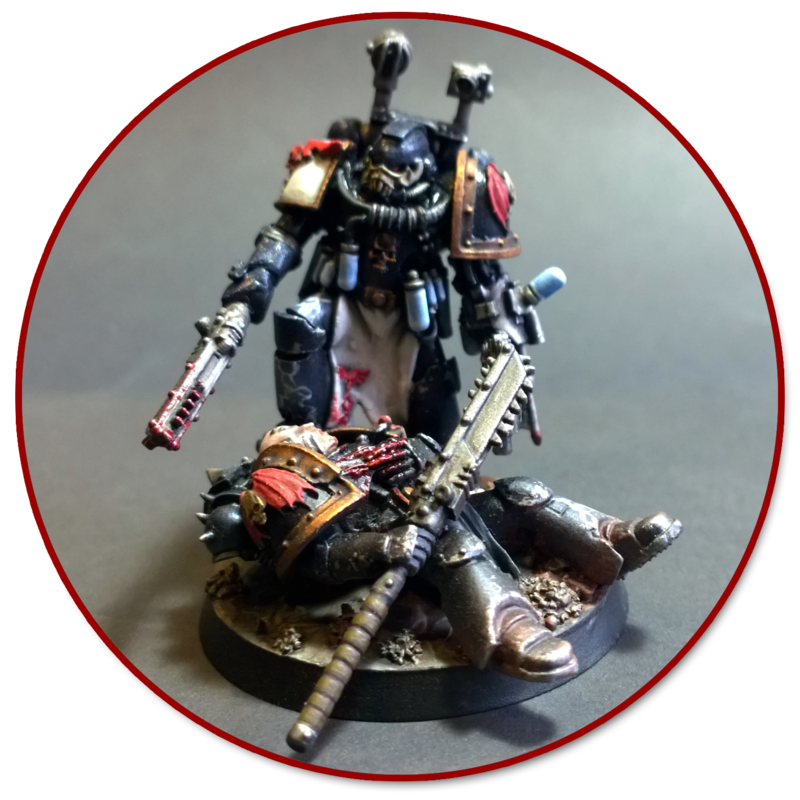 As you can see all his options are magnatized, allowing me to just make new weapon combos as apposed to multiples of the Praetor himself! 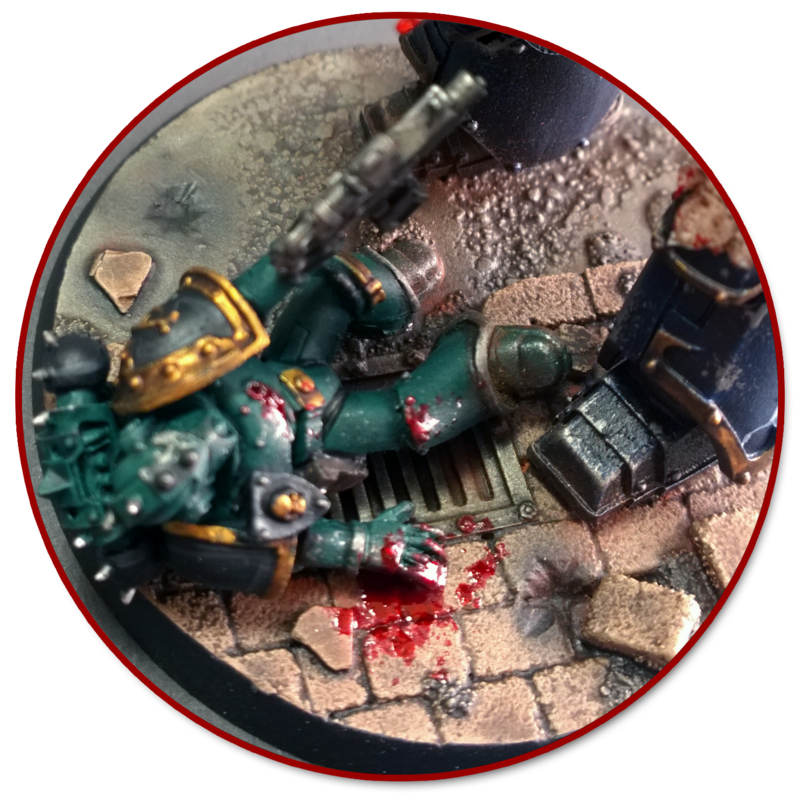 I went for a bit of a mini-diorama for the Apothecary, using another one of the wounded marines from GW. 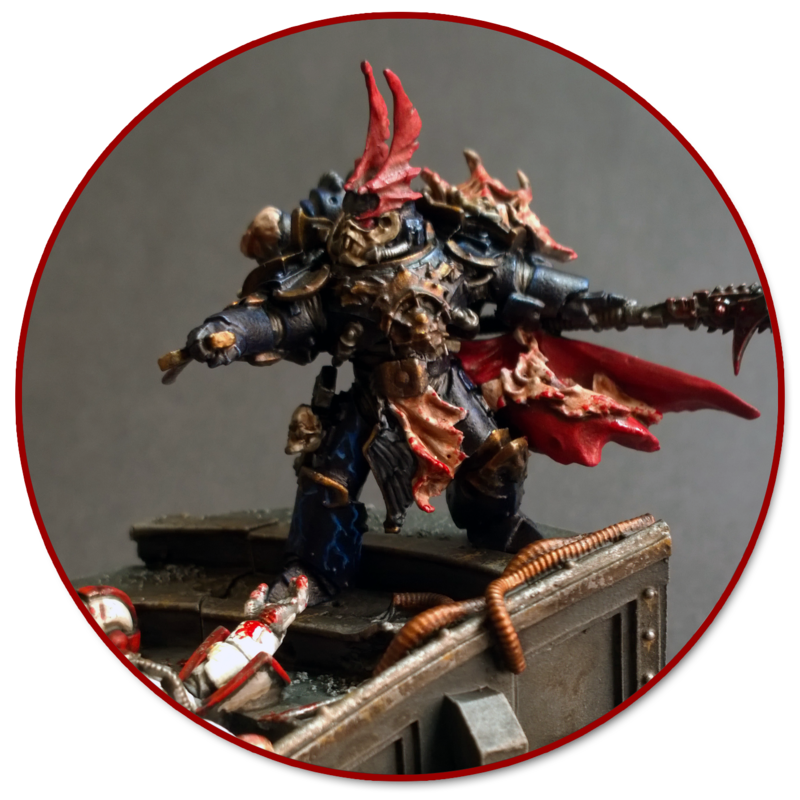 He has also been re-positioned and had a VIII Legion helmet added in addition to the pads and trademark Glaive. 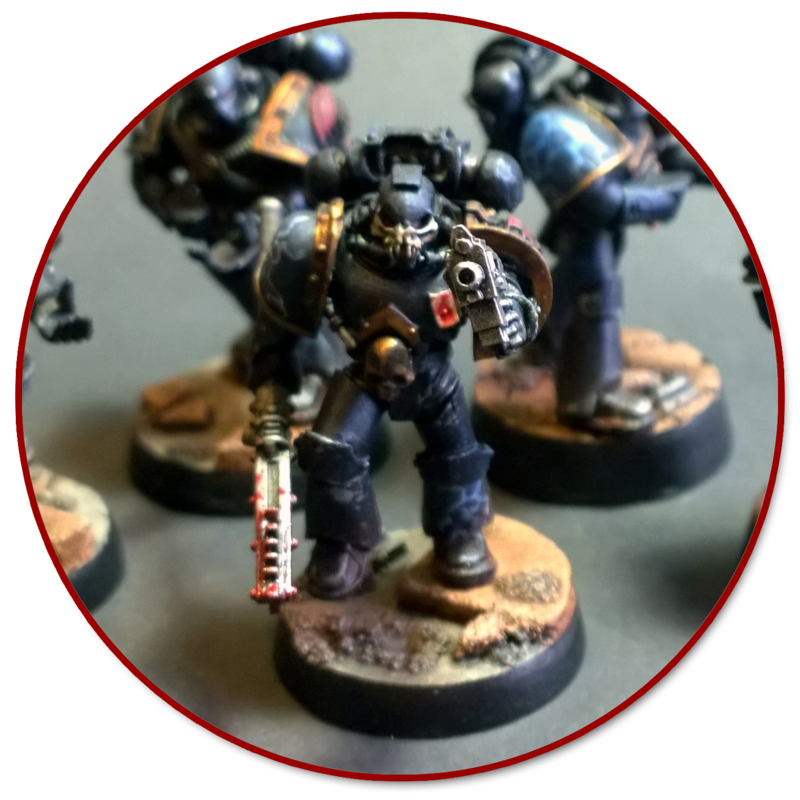 This is the first attempt at standard marines, room for improvement but table worthy at least. 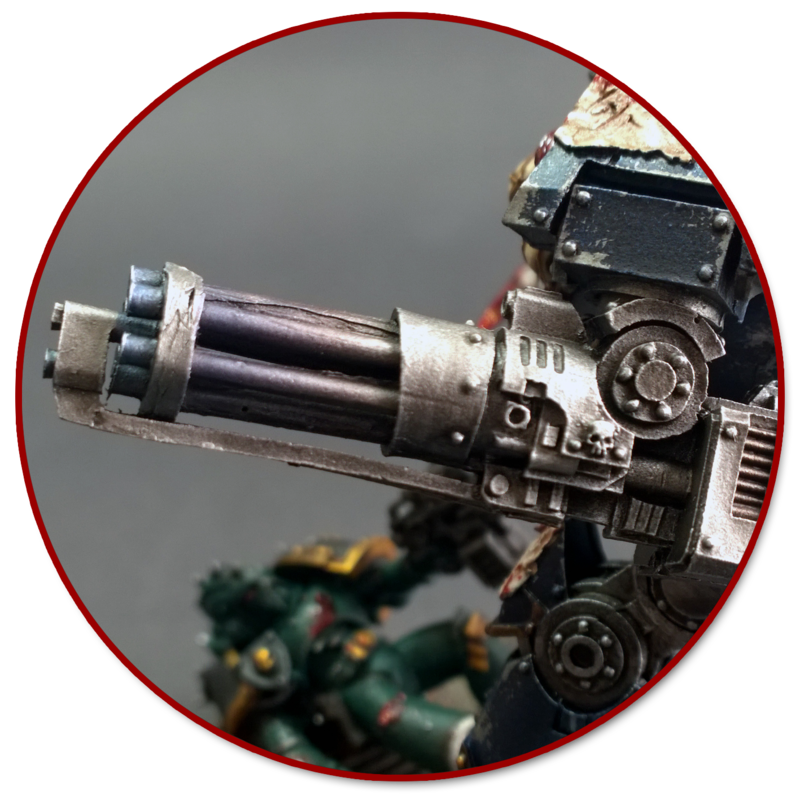 All the guns are being painted separately which allows me some tactical choice for the unit. 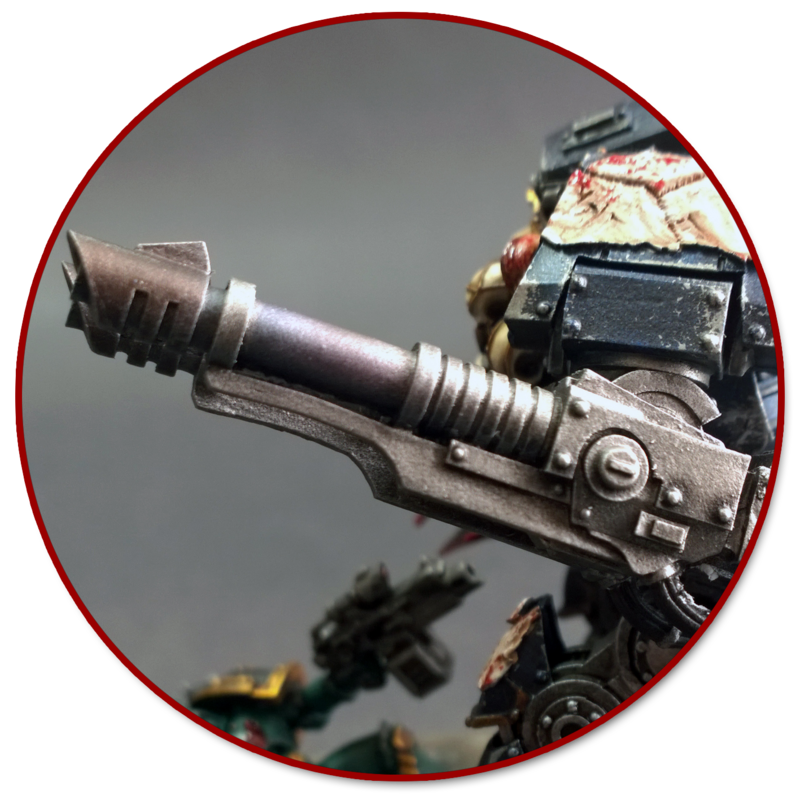 The Sergeants pistol is also magnetized like the options for the Praetor, allowing more choice in battlefield roles. 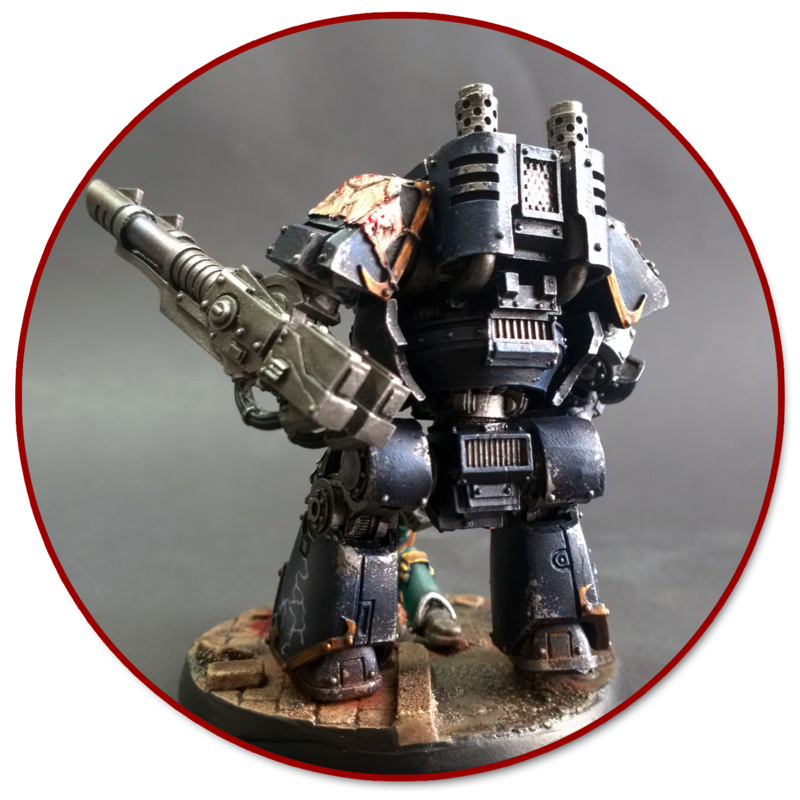 Here is my completed Contemptor Dreadnought. 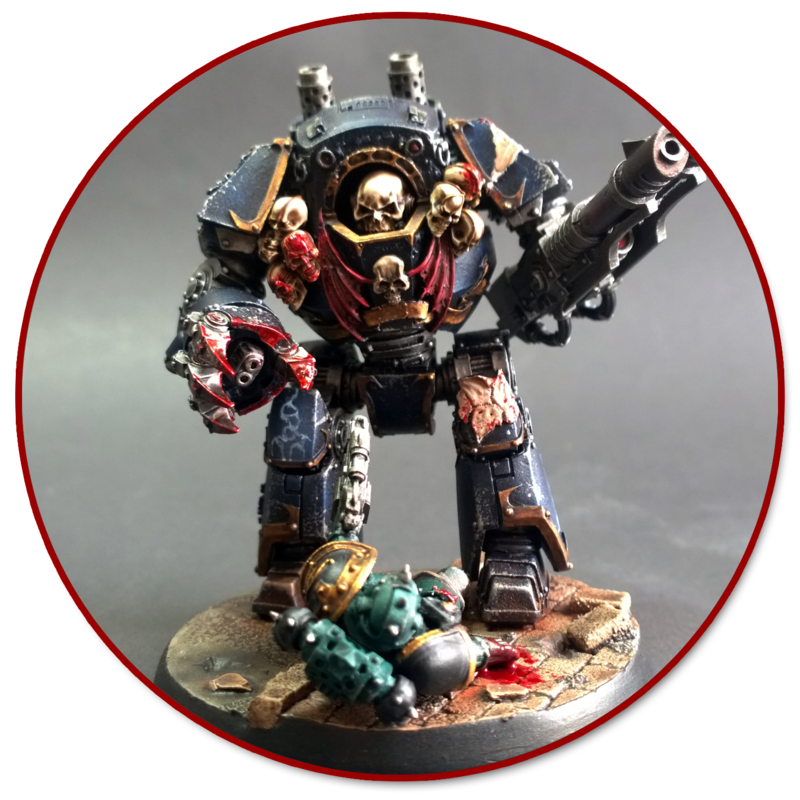 The armour was painted in the same way as detailed in my Sevatar post. Paint the lightning in Administratum Grey as a base coat, then were the lightning strikes meet, it was highlighted with white, once this was dry a technique called ‘juicing’ was used with an airbrush. 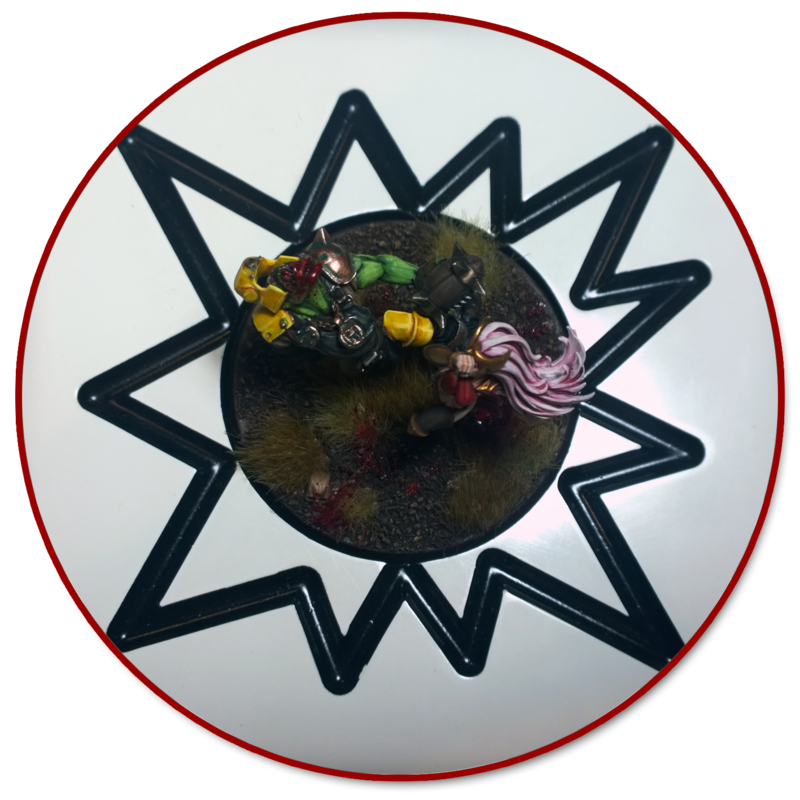 This involves filling the airbrush cup with thinners and adding 2 drops of white, which is then mixed in the cup. Then this very thin white wash is sprayed on a low PSI setting, very softly around the lightning, giving it a glowing effect. 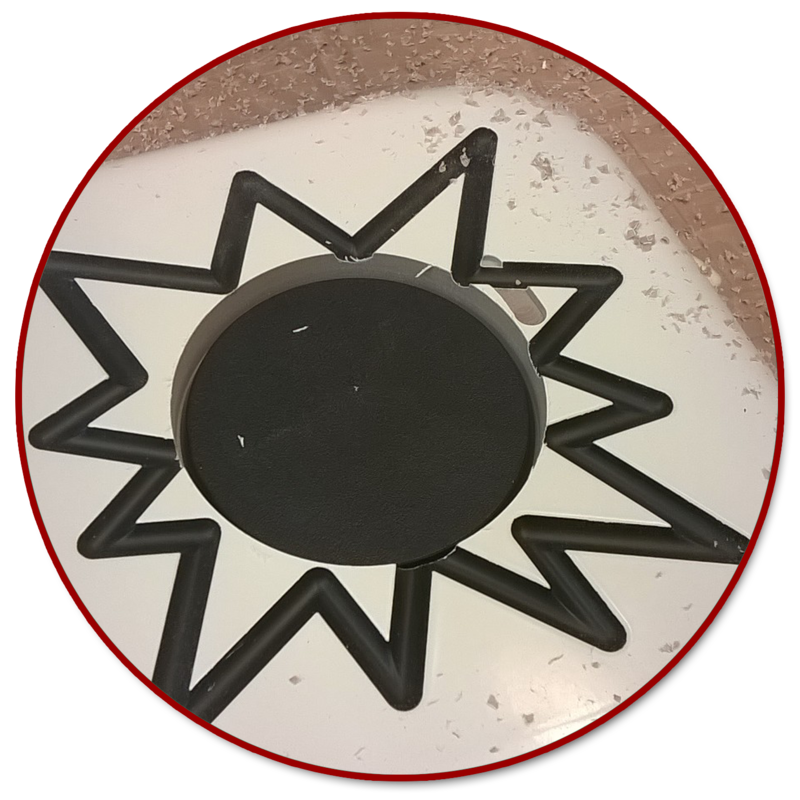 This was achieved by masking any overlapping metal with tape, so only the barrel itself is exposed. this was then airbrushed in a blend from the exit of the barrel going backwards in about 1/4 measurements with Blue then Purple then Sepia finally leaving the last 1/4 untouched. When this was dry the very end of the barrel was drybrushed with Mithril Silver. 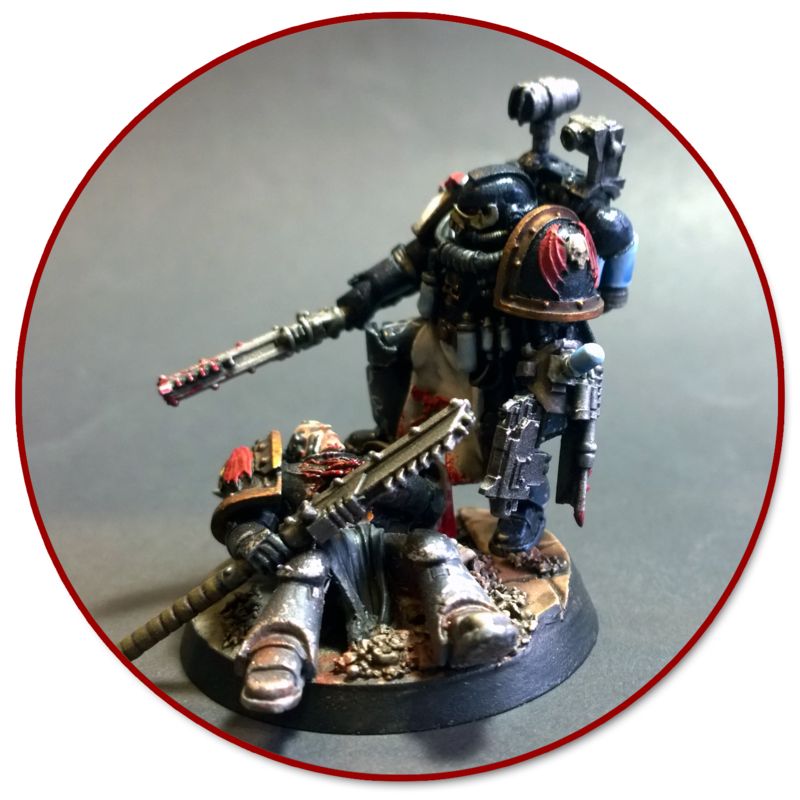 The base was again from Anvil Forge but with the addition of a GW injured marine, converted into a 30K Sons of Horus officer. 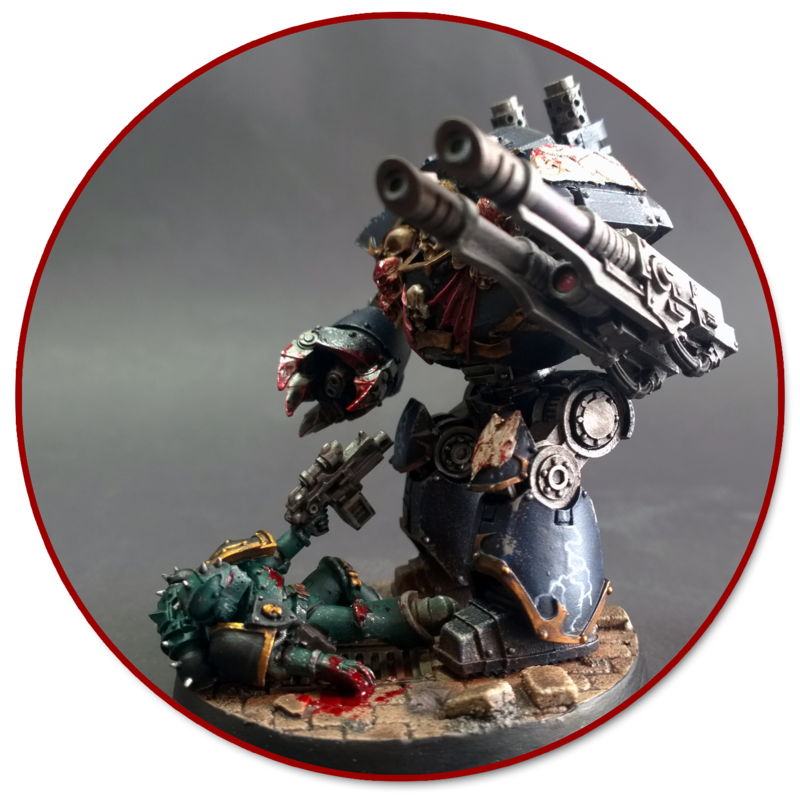 This was painted in the same way Forge World say they painted theirs. 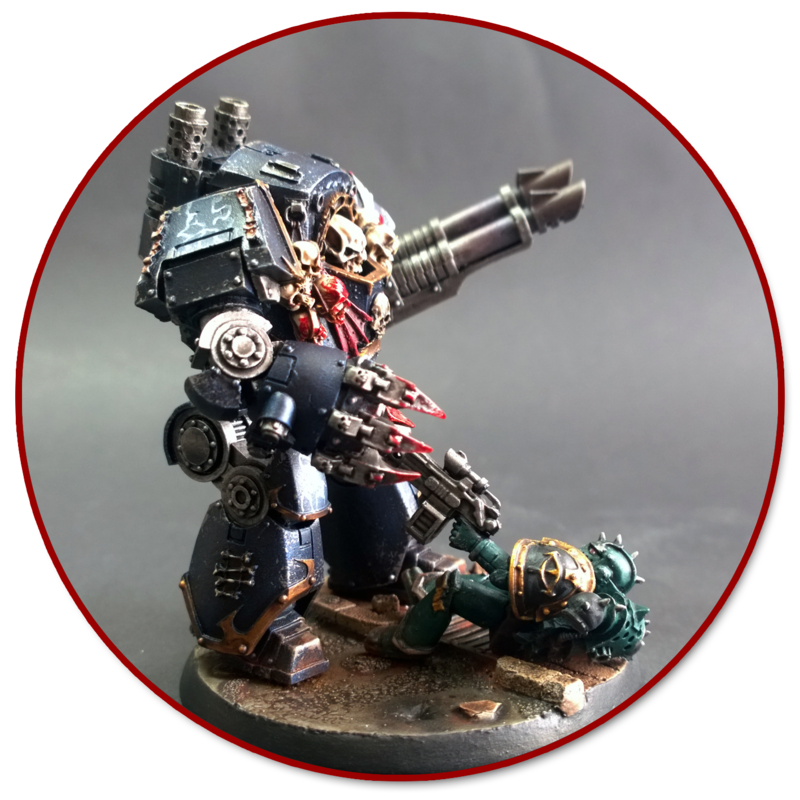 The weapons for the Contemptor are all drilled and magnetized, giving me maximum tactical options for the least financial outlay! 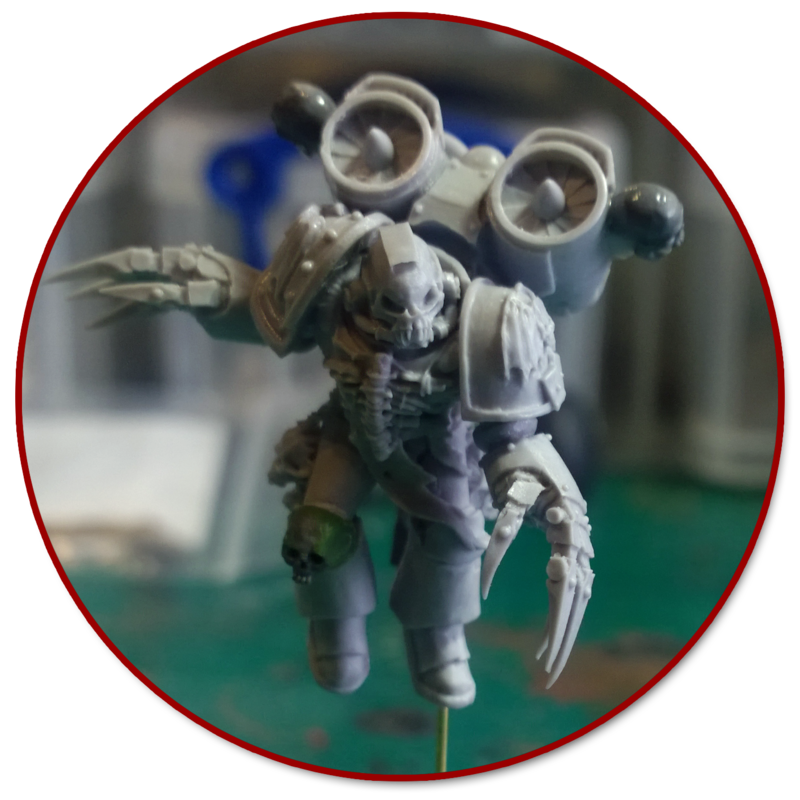 The Praetor was constructed with all options magnetized, since this hobby is hardly cheap, it also opened up more battlefield options without having to create a whole unit of characters! I’m going to make some more weapon options when I have the pieces and some battlefield experience. The Helmet is also awaiting some bits, namely some Vampie Count helmet wings before I start that piece. 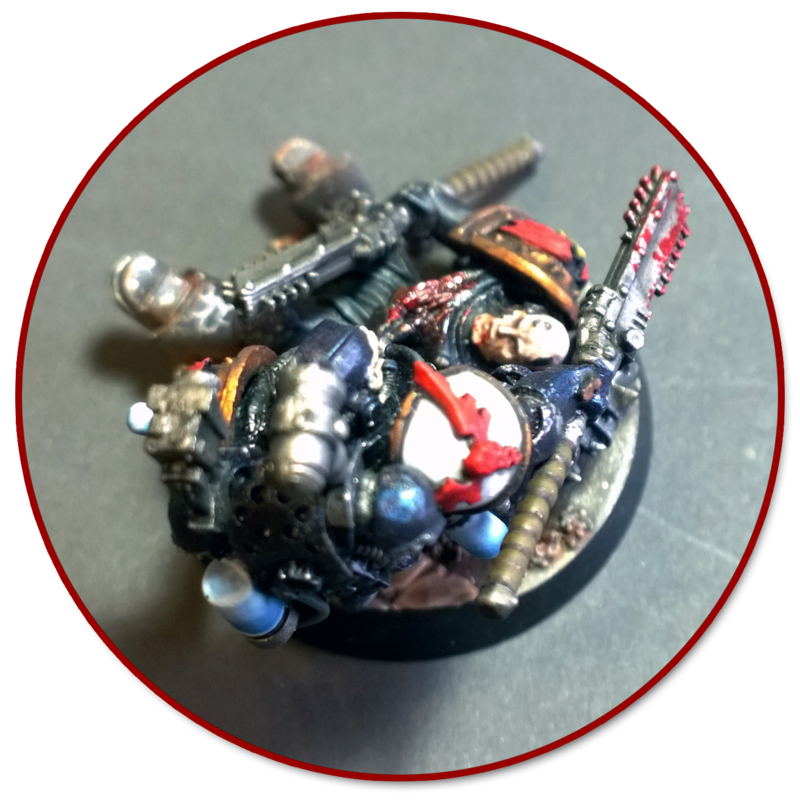 I converted up some of the 40K dead marines into 30K dead marines, which involved changing shoulder pads/helmets/weapons. 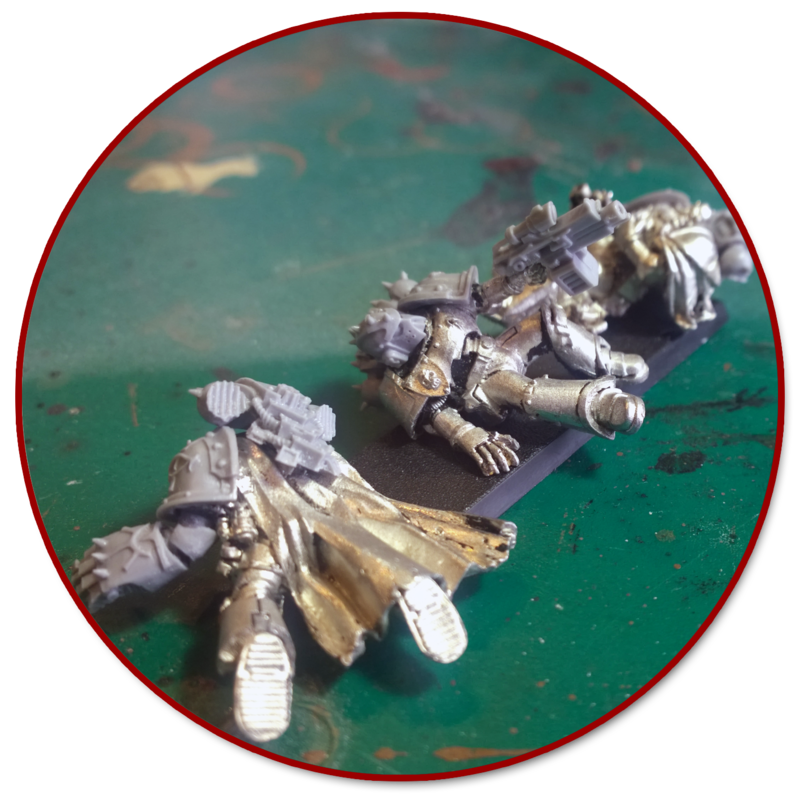 One of these will be the base detail for the Praetor, and another will detail my Contemptor base. This combined with Forge World releasing their head honcho, Night Haunter was enough for me to jump back in. 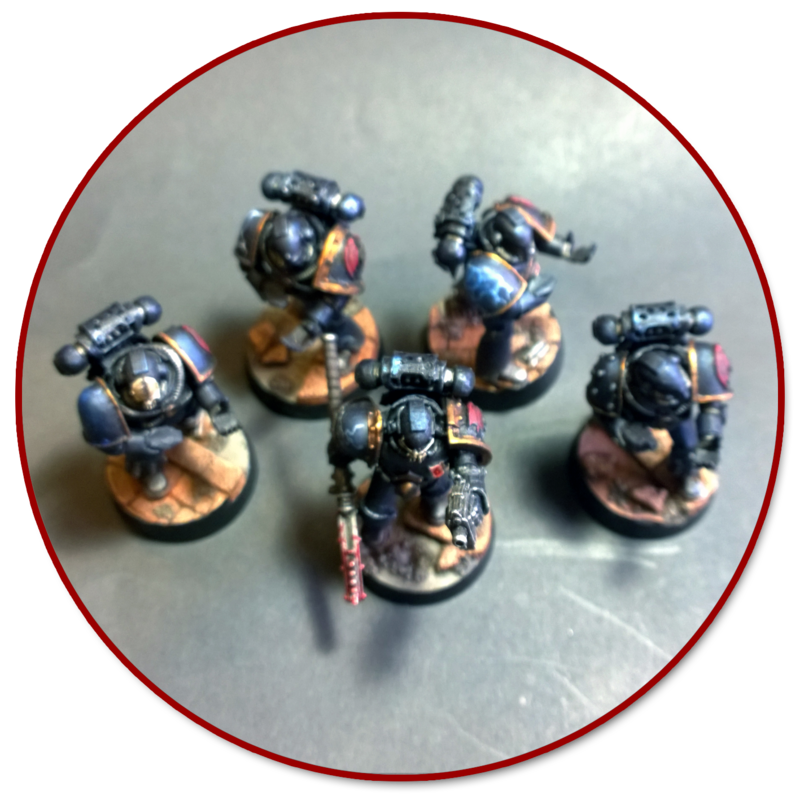 Having decided to go for Heresy-era Night Lords I ordered a bunch of Resin-Crack and got to it. 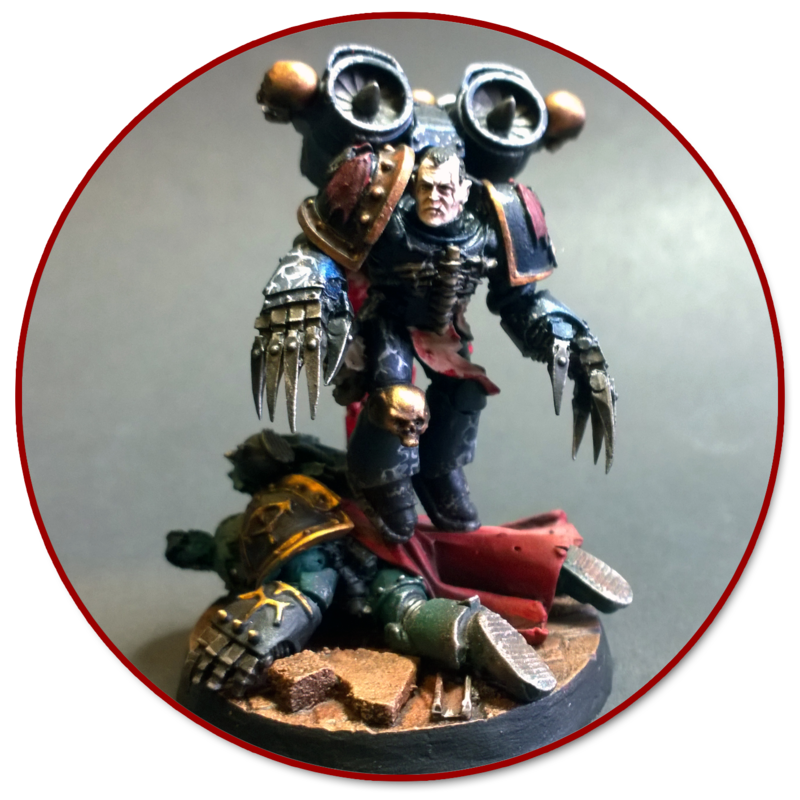 I started Night Haunter, but then Sevatar was released. I threw money at my screen until it was delivered and cracked on with Sev. 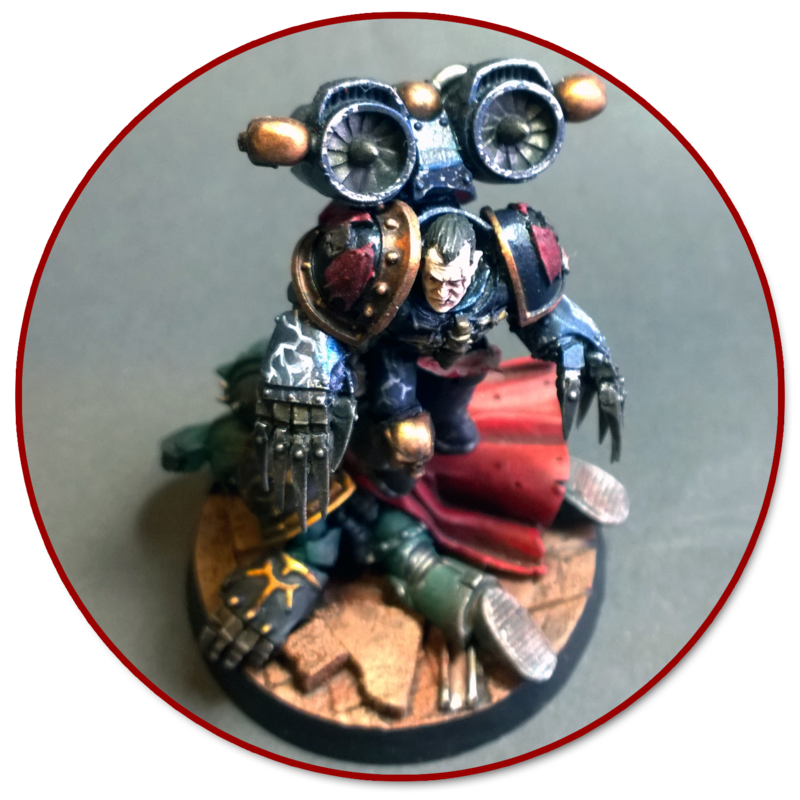 He’s the first Night Lord I’ve completed for my fledgling 30K force, and I’m not 100% happy with him but I tried out a bunch of new techniques and painting methods I usually stay away from. 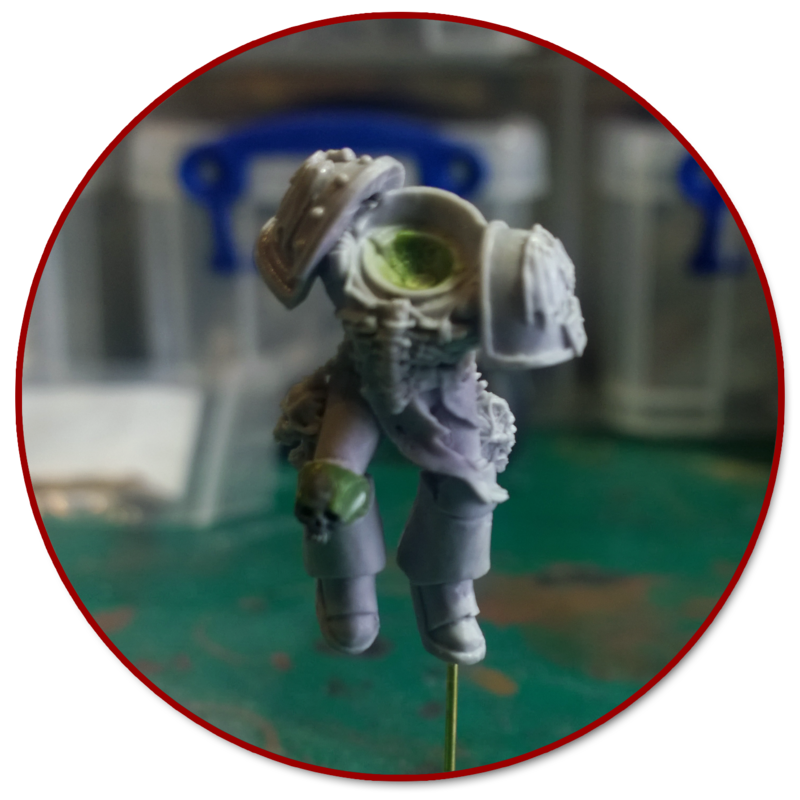 The armour was drybrushed with Rub and Buff Pewter, bringing the black undercoat upto a silver colour. Tamaiya Clear Blue and Clear Red were mixed together to make a clear purple which was applied over the whole model in 3-4 very thin coats. 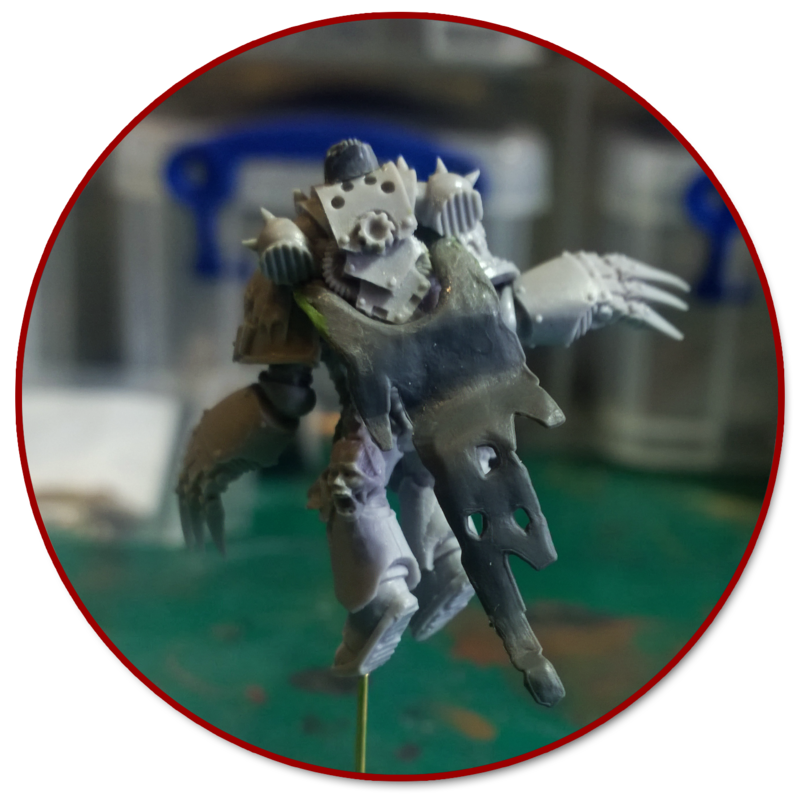 Once the model had dried, the whole thing was airbrushed with a layer of Auto Air colour Transparent Blue. 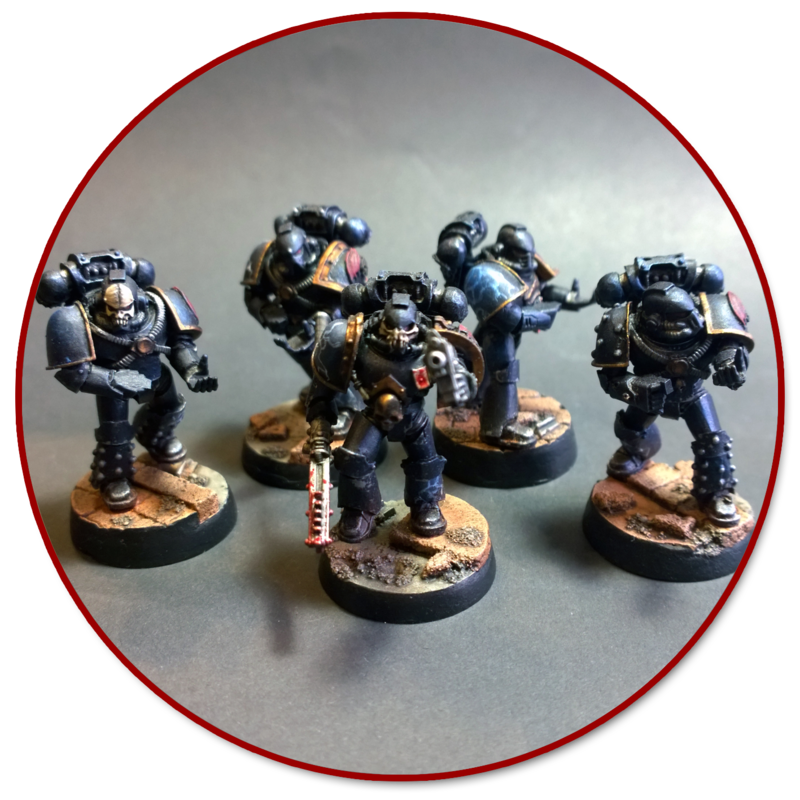 The Lightning strikes were painted on with Administratum Grey as a base coat. Then were the lightning strikes meet, it was highlighted with white. 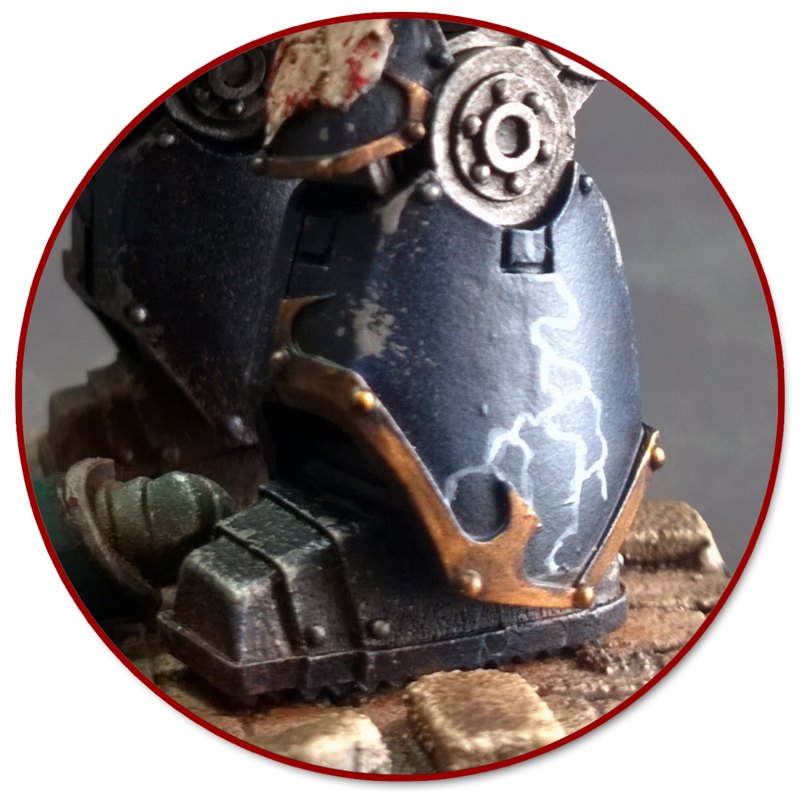 The armour trim was basecoat Warplock Bronze, Highlighted Balthazar Gold, followed by Gehennas Gold and finally given a wash of Agrax Earthshade. 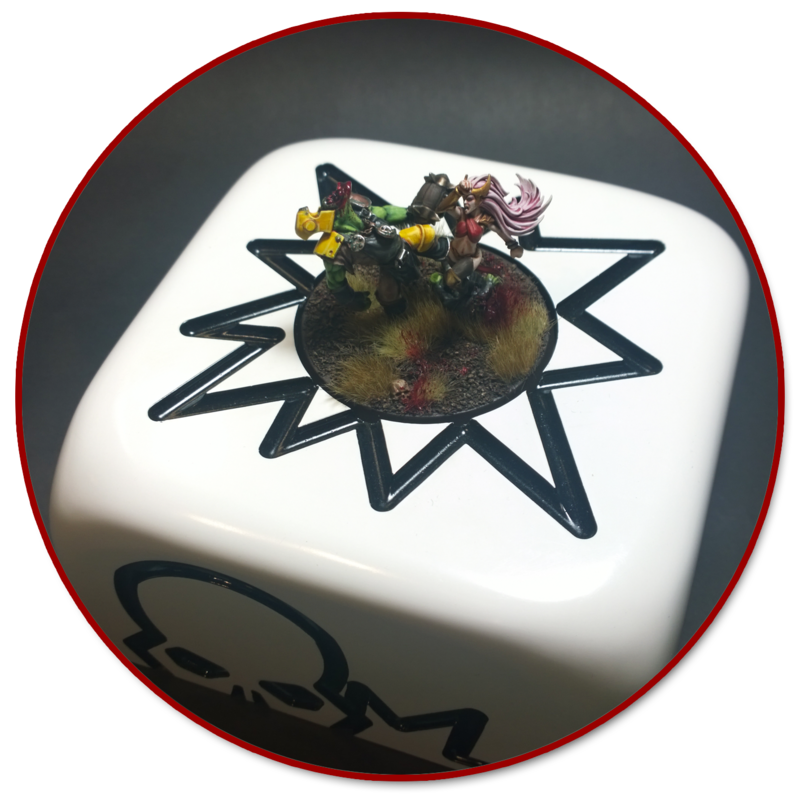 Once the model had dried, it was protected with a coating of GW Purity Seal. 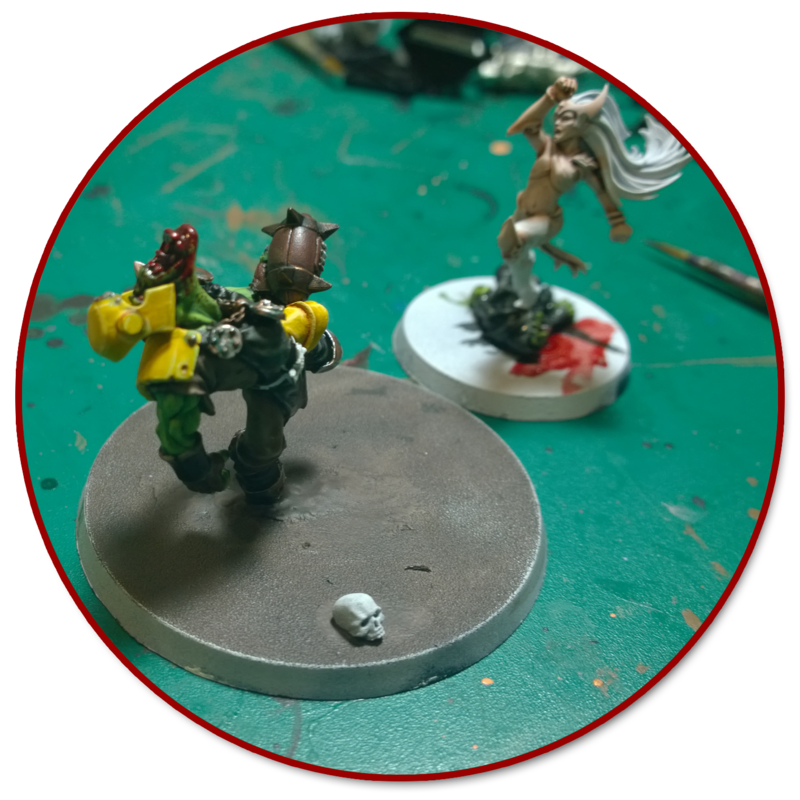 Here’s the process of the construction and painting of my NAFC Duel entry. 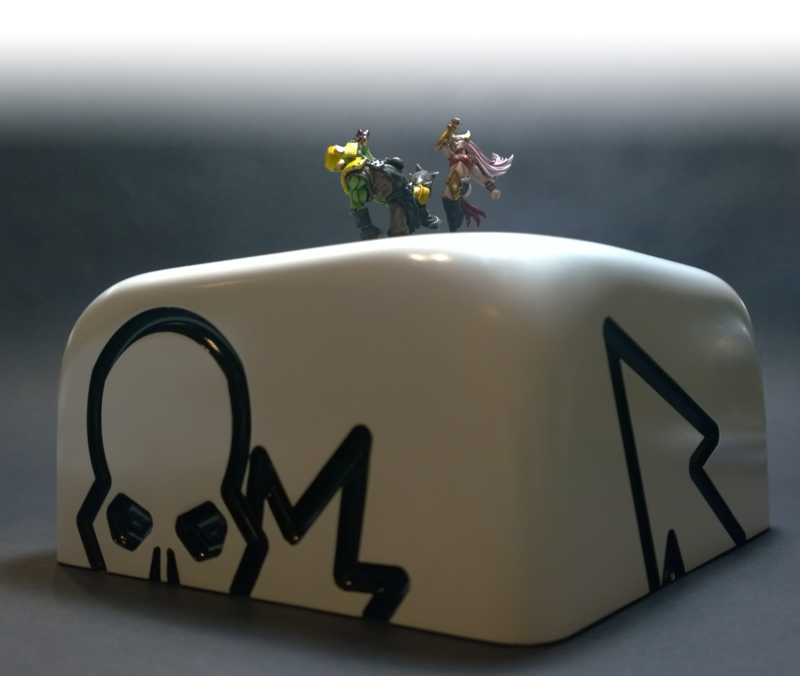 I was inspired by all of the outstanding entries of the 2014 Duel competition to such a degree that on the drive home an idea for the below popped into my head. Having been an life long Dark Elf player I appreciated the dynamic poses of the new GW Witch Elves, this exact pose has been used for one of my team Witches, so that was a no brainer. 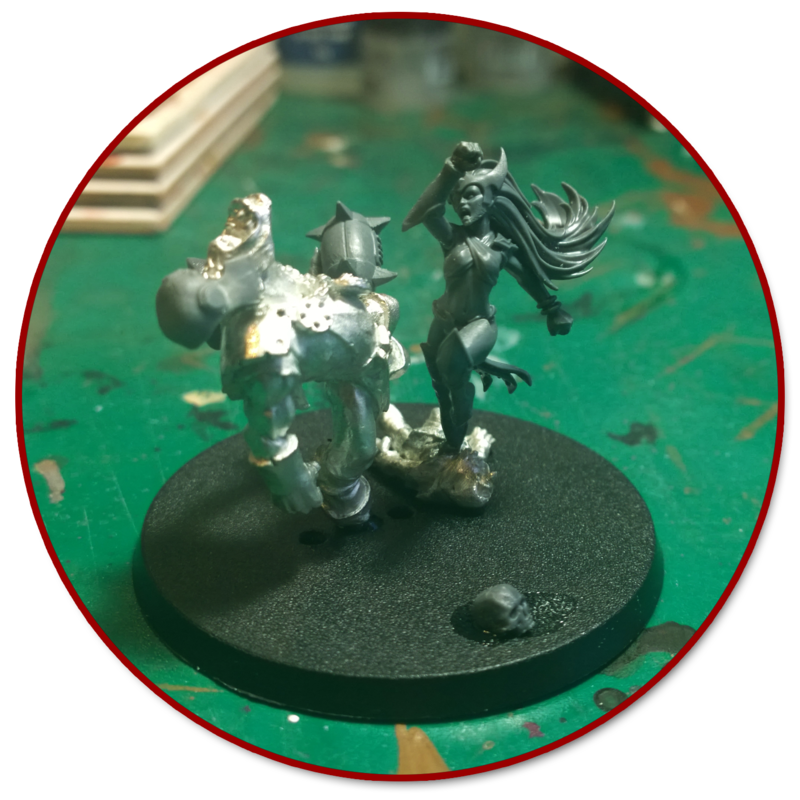 When it came to her opponent I looked through the GW web store (barren as it is nowadays…) and remembered the Animosity Orcs from WFB, such great models that were crying out for some Blood Bowl action! 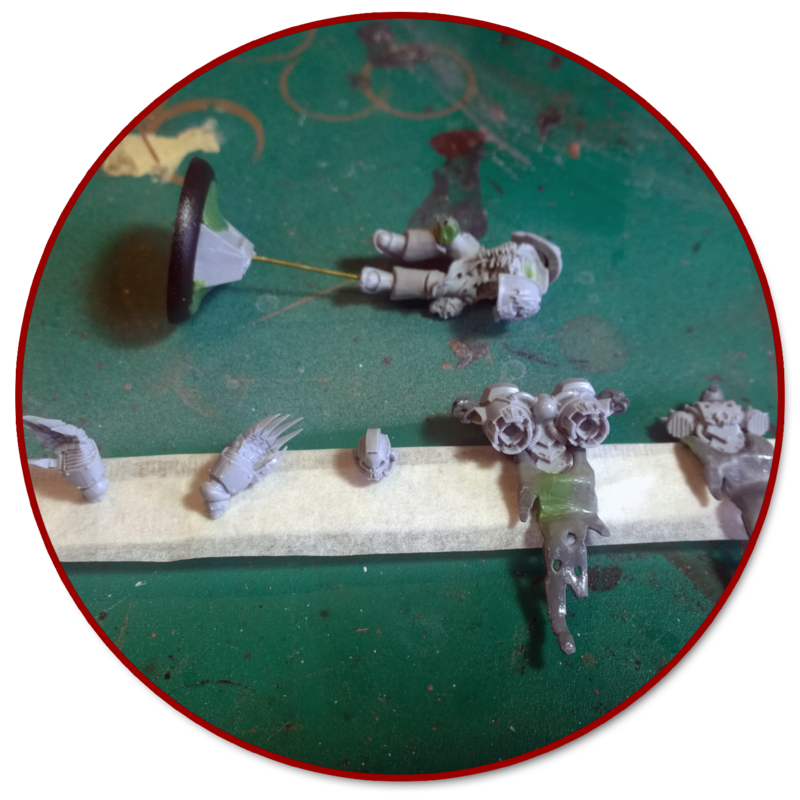 It was a simple job of adding the arm holding the ball & green stuffing the join (a 40K Ork arm that usually holds the firearm), scooping out the head (!) 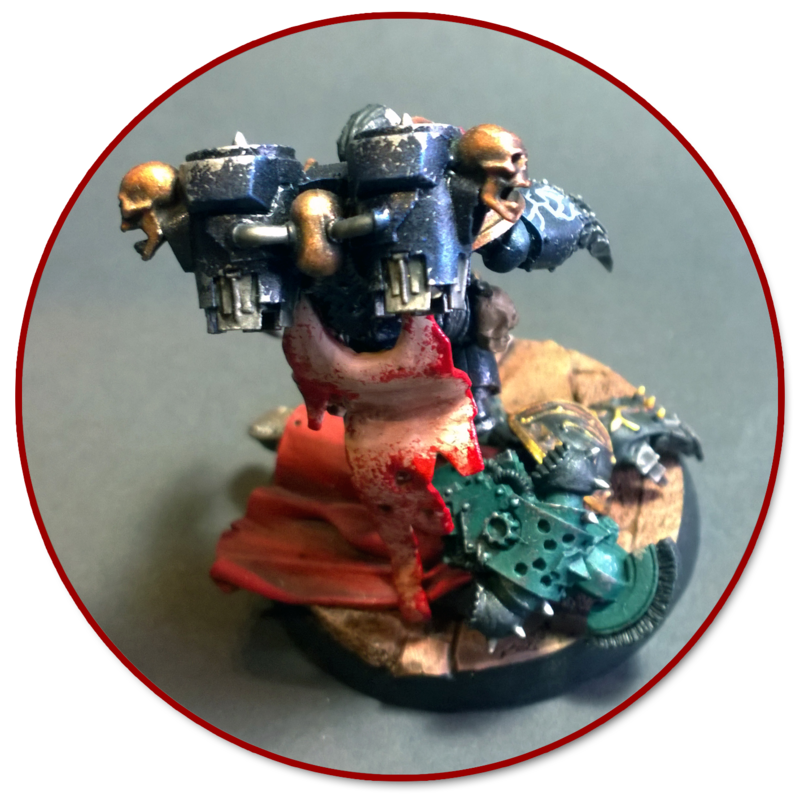 of yet another unfortunate 40K Ork to gain his helmet and adding a shoulder pad from the WFB Orc sprue to make the Blood Bowl-ification complete. 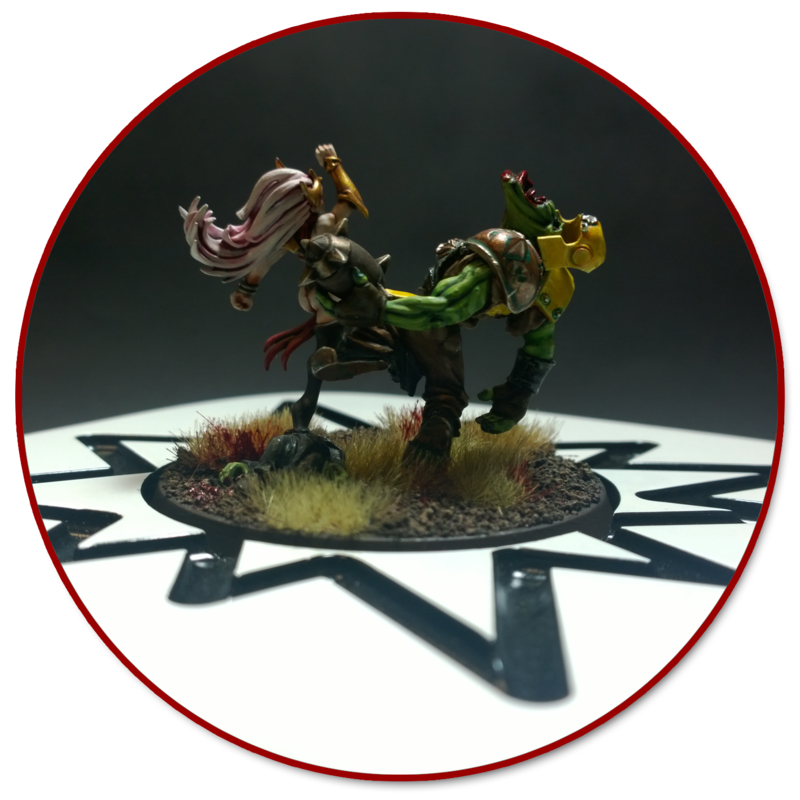 You’ll notice that the Witch is leaping off the broken body of a fallen Gobbo, this was also from the Animosity Orc kit, and he’s normally being wielded as a weapon by another greenskin. 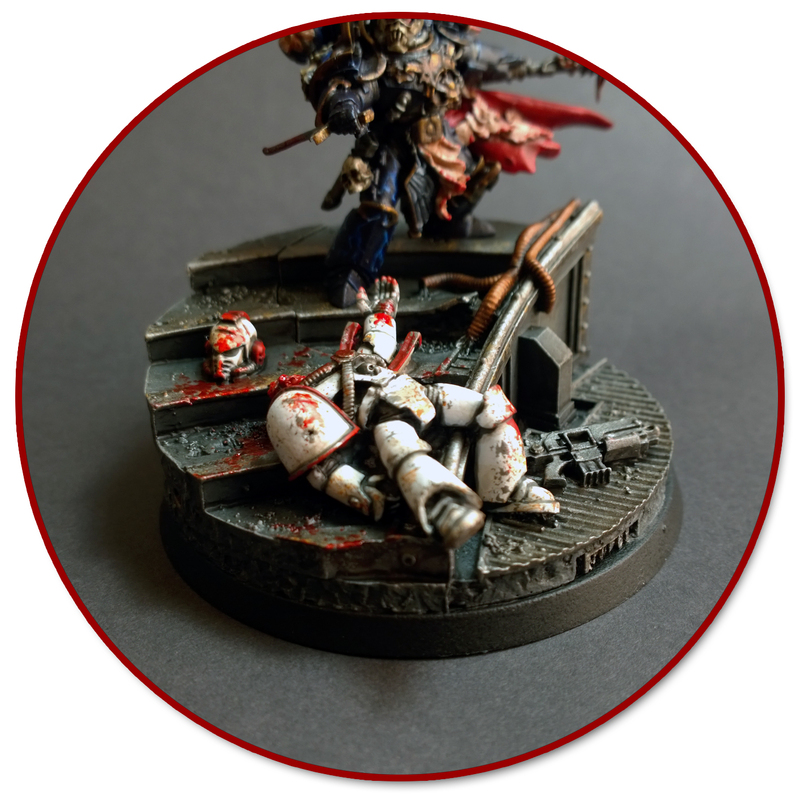 So I removed the hand griping his head & flattened the back his body, with that he was ready for the diorama. 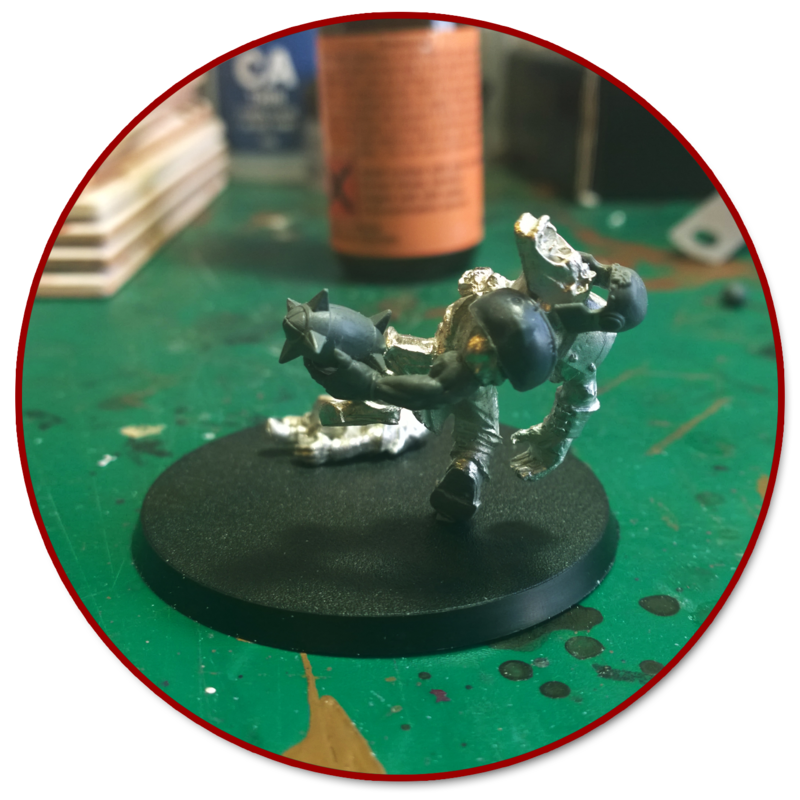 I followed an old White Dwarf ‘Eavy Metal article for the orc, it was taken from the scheme for the plastic Ork Warboss, the Witch Elf utilized the new Wash & Mediums GW now produce. 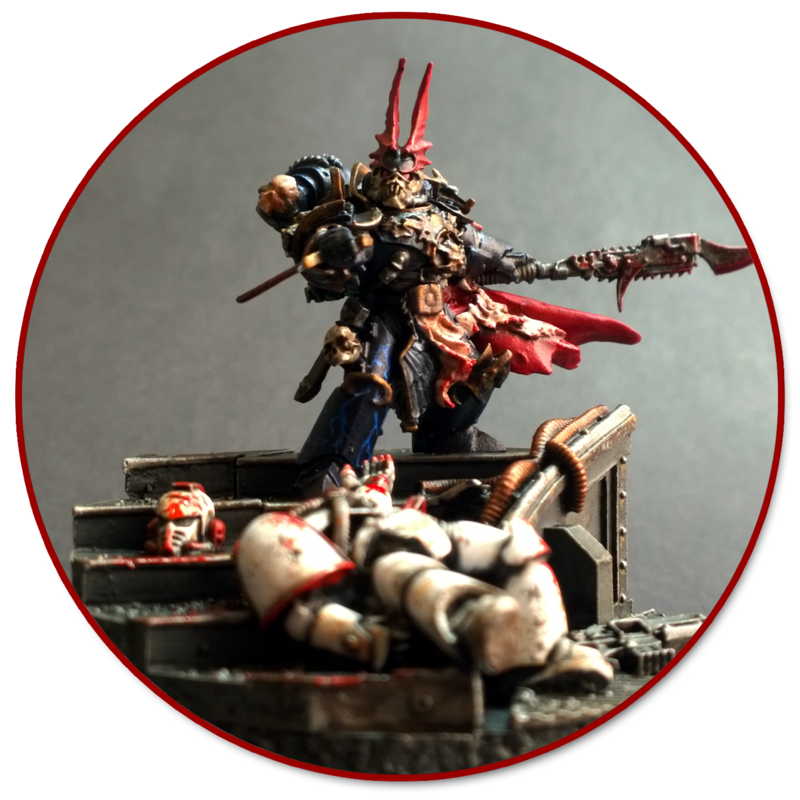 The blood is a mixture of GW’s Blood for the Blood God (what a stupid name…) & Tamiya Red. 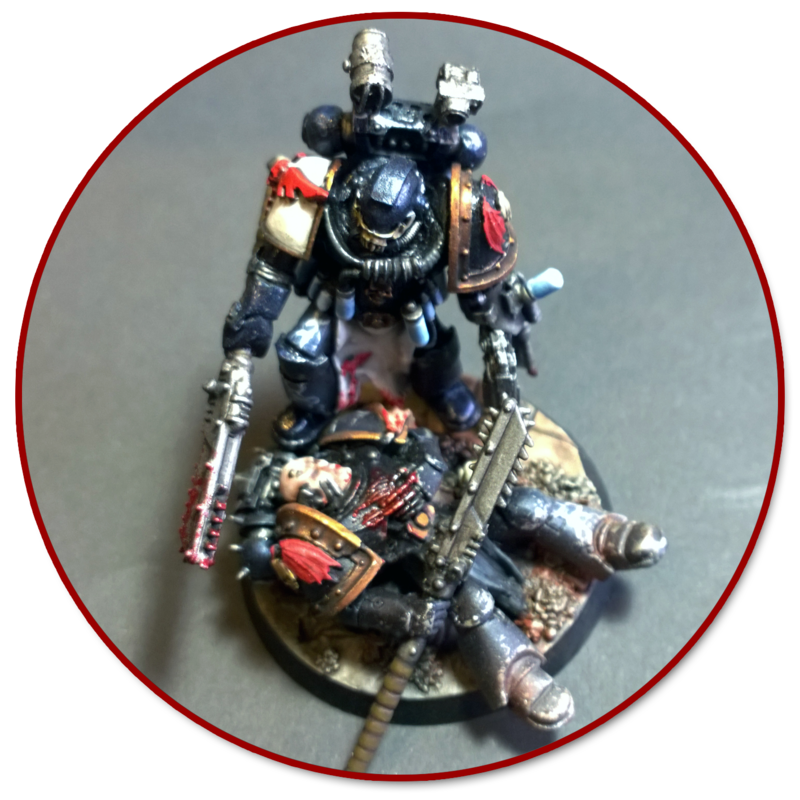 You can see that I kept the Duel’ers separate for the painting, that way I could position them much more closely once they had been painted. 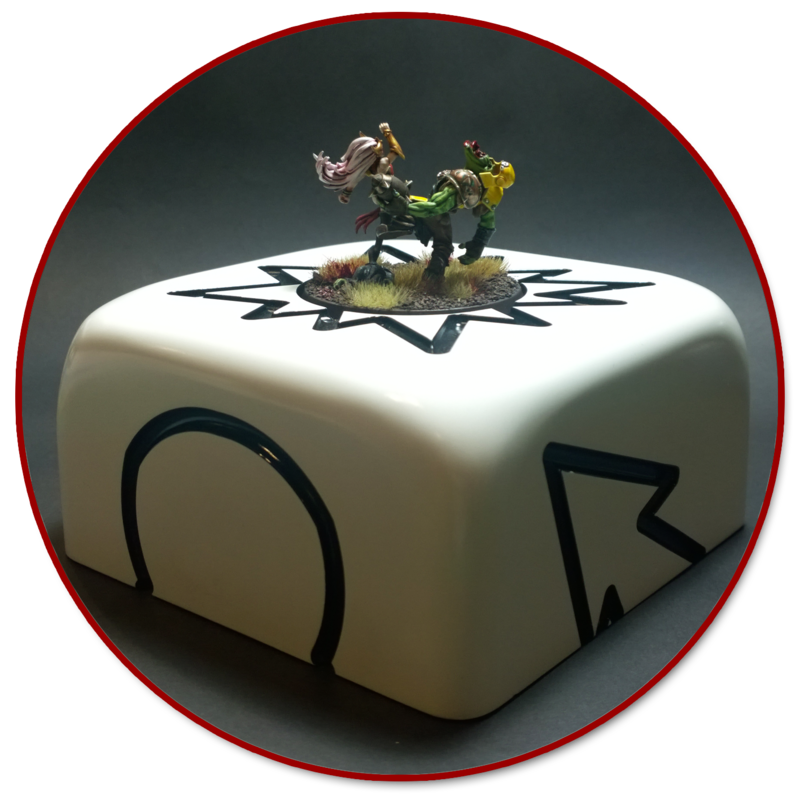 I talked the resident Team Model Maker, Alan ‘Lamby’ Casey about a display base for the project. 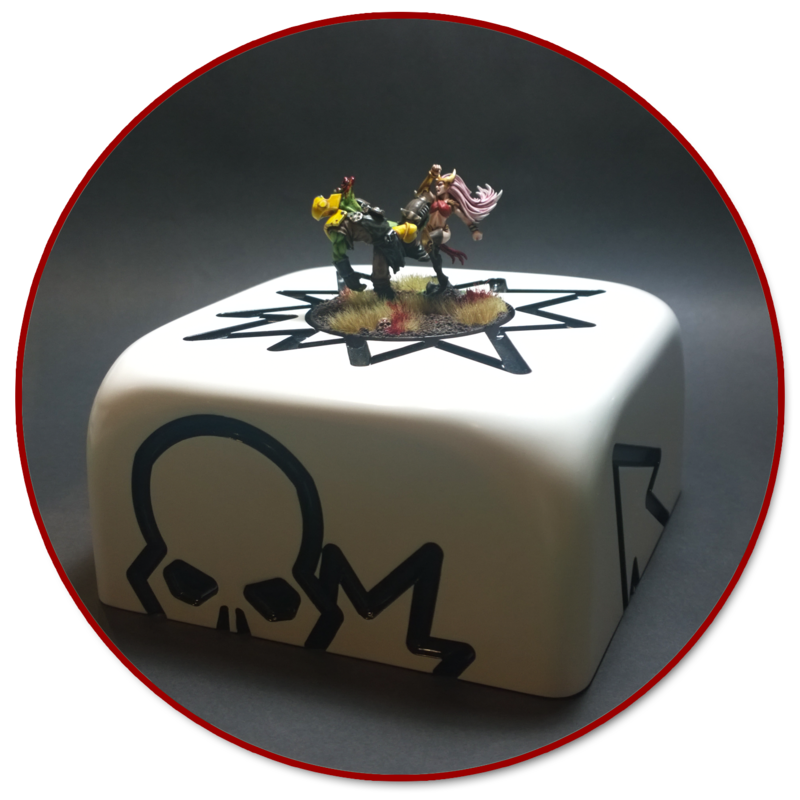 (You may know him from his awesome Dwarf Slayer team with custom beer barrel display) Things quickly evolved from a classic wooden display base, to a Block Dice and finally to a rotating display Block Dice! I re-drew the dice face icons in Illustrator and then sent them over to be used in the laser cutting of the faces, the rest of the craftsmanship was then expertly executed by Lamby, including all the whirly gubbinz & gears contained within the base to make it rotate. Here’s a video of the finished piece in motion.